Ages 4 through 10.Take aim against apraxia and other motor speech disorders with the high-interest, motivating activities in this practical book. Each lesson includes a short story that emphasizes a small number of words with similar sound patterns. After listening to the story, the student is asked questions to elicit the target words. Reproducible pictures showing each of the target words are included. The questions and activities that follow each story build language skills as children practice using target speech patterns that occur frequently in the language. The book also includes word lists, homework activities, and other materials. All of the activity worksheets may be reproduced. Consonant Patterns. The activities in this section target the articulation of words that require a transition from a velar consonant to an alveolar consonant (e.g., cat) or the transition from an alveolar consonant to a velar consonant (e.g., tack). Specific Consonants. 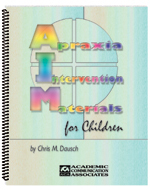 The activities in this section target sibilant sounds and affricates that tend to cause difficulty for children with apraxia. Multisyllabic Patterns. The activities in this section target three-syllable and four-syllable units of speech. Words Containing Diphthongs. The activities in this section each target a specific diphthong. Words Containing Blends. The activities in this section each target a blend containing the /s/ sound. Answering Questions. The student responds to questions about the story. Producing Words in Sentences. The student is presented with sentences in which an inappropriate word is used. The student must fix the sentence by using the correct word from the story. Talk About It. The student responds to questions related to the topic of the story. Picture Naming and Describing. The student names pictures of the target words and uses them in sentences. Additional Practice. The activities provide practice in creating sentences and short stories that contain words with the target pattern. Home Activities. These reproducible worksheets include pictures of the target words and activities that can be implemented by family members. A unique feature of this book is that the activities build language and thinking skills in addition to helping students improve speech production. Apraxia therapy does not need to be boring!